Author(s): Sabata Martino, Francesco Morena, Carolina Barola, Ilaria Bicchi, Carla Emiliani. Department of Chemistry, Biology and Biotechnologies, University of Perugia, Via del Giochetto, 06126 Perugia, Italy. Epigenetic mechanisms orchestrate inheritable concerted networks essential for chromatin remodeling. Molecular interplays include post-translational modifications to histones, DNA methylation, activity of small non coding RNAs, govern activation and silencing of gene expression and define the molecular basis of pluripotency, reprogramming, early human development and differentiation. The implications of epigenetic regulation in maintaining stem cell fate determination are well known. Thus: (i) embryonic stem cells (ESCs) seem to employ selected histone modification mechanisms for maintaining pluripotency and for the activation of multipotency programs; (ii) induced pluripotent stem cells, while recapitulating the overall features of the ESCs epigenome, express differences in DNA methylation; (iii) the lineage-restricted process of adult mesenchymal stem cell differentiation involves epigenetic regulation and consists of a unique pattern of DNA methylation and histone modifications; (iv) the epigenetic profiles of adult stem cells correlate with a more restricted differentiation potential as compared to ESCs. 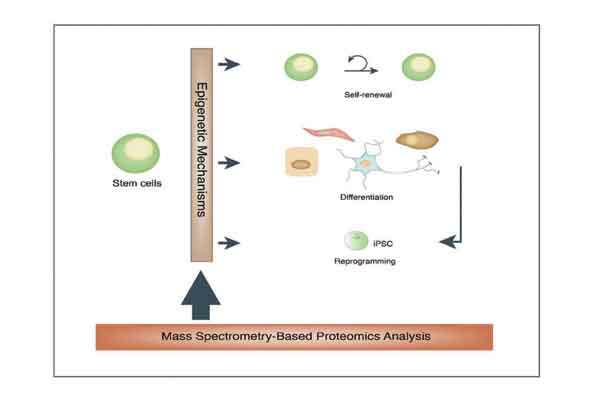 This review will discuss the role of epigenetic regulation in pluripotency, stemness and cell fate specification, taking advantage of recent discoveries showing that mass spectrometry and proteomics are become indispensable tools in epigenetic research. Keywords: Epigenetic, histone modifications, methylation of DNA, proteomic profile, reprogramming, stem cells. Affiliation:Department of Chemistry, Biology and Biotechnologies, University of Perugia, Via del Giochetto, 06126 Perugia, Italy. Keywords:Epigenetic, histone modifications, methylation of DNA, proteomic profile, reprogramming, stem cells. Abstract:Epigenetic mechanisms orchestrate inheritable concerted networks essential for chromatin remodeling. Molecular interplays include post-translational modifications to histones, DNA methylation, activity of small non coding RNAs, govern activation and silencing of gene expression and define the molecular basis of pluripotency, reprogramming, early human development and differentiation.